Attendees exploring a new city have traditionally had to rely upon word-of-mouth or hotel concierge recommendations to find the best deals on dining and activities around town. All of that is changing with the launch of the new Austin Insider Deals program by the Austin Convention and Visitors Bureau. 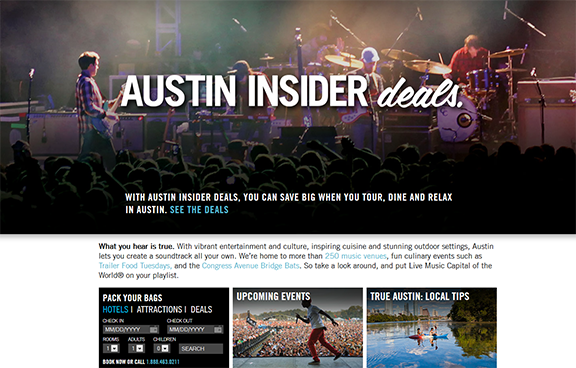 Introduced this summer, and featuring a growing network of participating businesses, Austin Insider Deals provides visitors with unprecedented access to the best deals in Austin. The program gives attendees an exciting new way to take advantage of fabulous offerings from local Austin businesses, all at the touch of a Smartphone screen. Discounts can be found for restaurants, activities, transportation and more. "We are always looking for better ways to engage with our visitors, meetings attendees and Austinites, while still promoting local business," said Bob Lander, President and CEO of the Austin Convention and Visitors Bureau. "Our new deals program provides both of these seamlessly." The Austin Insider Deals program is easily accessible to meeting planners and attendees through the Austin CVB&apos;s website. Inaugural partners span a range of categories that will appeal to attendees of all types and include popular local businesses like The Cedar Door, offering 50% off select cocktails; Iron Cactus serving up a free appetizer with the purchase of an entrée; the Hilton Austin Airport offering hotel guests 10% off any spa treatment; and transportation company SuperShuttle treating visitors to 10% off airport transportation services. Deals can be redeemed by printing out the coupon or by simply showing the deal on a Smartphone. "The Austin Convention and Visitors Bureau is a trusted representative of the city," said Jennifer Elliott, Owner of Pubcrawler, currently offering 10% off their popular pub tour through the Austin Insider Deals program. "Partnering with them on this program allows us to connect with visitors and locals in a whole new way while still supporting local businesses." Now meeting planners and attendees can experience the city&apos;s diverse offerings like a true Austin Insider. For more information about Austin Insider Deals, visit the Austin Insider Deals page on the Austin CVB&apos;s website or contact Austin CVB Director of Partnership Development, Susan Richardson at Srichardson@austintexas.org.